Media Markt/Saturn is Europe's largest retailer of consumer electronics. The outlet is known for its funny, but crude advertising campaigns - its main slogan is "I am not stupid!" 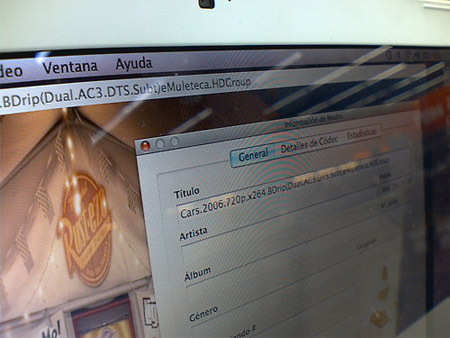 In the Saturn store in the Rivas H2Ocio shopping mall, Madrid, they use pirate Blu-ray rips to sell Apple hardware. Stupid - or not? You decide. Apple is no stranger to making millions of dollars off the back of piracy. After all, rampant MP3 piracy has proven to be the lifeblood of its 160gig iPods, even if you discount the Middle Eastern Sheikh customers who can actually afford to fill one. But there are other more subtle ways for the company to benefit from copyright infringement. Who remembers our article from 2008, when we showed an aXXo release being used to sell Macs in a John Lewis store? Well, now it looks like another retailer had the same idea – why spend money on real DVDs when you can just download them? On a visit to the Rivas H2Ocio shopping mall in Madrid, Miguel Ángel Moro walked into a Saturn store. There, in the Apple section, he saw demo machines – and they were all running pirate movies. Displaying their own DVDs is illegal without clearance, so they might as well grab a copy off BitTorrent and safe a few bucks – right? Sharing copyrighted files is legal in Spain, but not for commercial use which is clearly the case here. Below is a photograph taken by Miguel of a ‘Cars’ Blu-ray movie rip running on VLC Media Player, on a Macbook, in the store.